During his past five games, Cleveland Cavaliers rookie Collin Sexton has broken records belonging to Kyrie Irving and LeBron James. The former Alabama standout eclipsed Irving’s record for the most 3-pointers made by a Cleveland rookie with 74, and he broke James’ record for consecutive 20-point games by a Cavaliers’ rookie with five. Over the past five games, Sexton has averaged 26.4 points per game by shooting 55.7 percent from the floor, 51.5 percent on 3-pointers and 89.5 from the free-throw line. After scoring 28 points in Cleveland’s loss to the Dallas Mavericks on Saturday night, Sexton was asked if he was getting stronger as the season wound down. Sexton’s surge has gotten attention around the NBA. At 2,170, Sexton has played more minutes than any other NBA rookie this season. His 1,111 points rank third among the league’s rookies behind Luka Doncic of the Dallas Mavericks and Trae Young of the Atlanta Hawks. Sexton joined the Cavaliers as the eighth player picked in the NBA Draft on June 21, 2018. He entered Cleveland’s starting lineup in the 11th game of the season and has stayed there for 60 games. For the season, Sexton has averaged 15.9 points, 3.0 rebounds and 2.9 assists per game. For the season, Sexton has made 40.2 percent of his 3-point shots — 90 of 224. “The knock was that he couldn’t make a 3,” Cavaliers coach Larry Drew said. “Now he has shown that he has the ability to not only make the 3, but he’s confident shooting the 3. 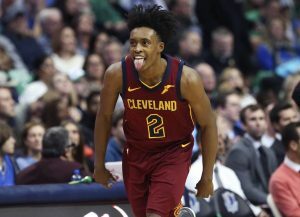 Drew called Sexton’s performance in the Cavs’ 126-101 victory over the Toronto Raptors on March 11 “probably as complete of a game as I’ve seen Collin play.” Sexton’s scored 28 points, had five assists and lost no turnovers.